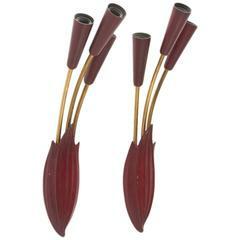 Pair of sconces very nice large sconces designed by L.Kalff for Philips, Holland, 1950s. These fully opal ribbed glass lamps are hold by a metal frame gold painted and are in a very good condition, labeled by Philips. Shipping Complimentary. Exceptional constructivist design in Bauhaus style. Opaline glass in a mold formed with a bakelite suspension, labeled RAAK. 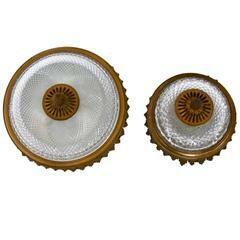 Two Italian1950s wall lights. Measures: Height 37 cm. Width 13 cm. Depth 20 cm. 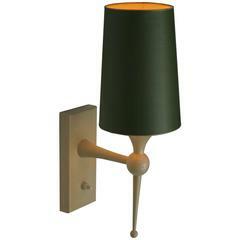 Large lights with white opaline and copper finish metal inlay. Elegant geometric wall lights by Philips, Netherlands, 1960s, in light grey and white enameled metal, marked. Vintage pair of Philips opal sconces.